U.S. Army War II Veteran and OK Alpha Brother Carmon Coleman Harris of Oklahoma City, Oklahoma died on this date. NY Alpha Brother Major Oscar Bomboy Millard, U.S. Army (Retired) died on this date. Oscar was born in Centralia, Pennsylvania, and graduated from Syracuse University with a business degree. Later he was a resident of Jacksonville and Atlantic Beach, FL. After retiring from the Army, Brother Millard had a career in Civil Service Finance before completely retiring. His memberships included Northeast Florida Chapter of the Retired Officers Association, Solomon Masonic Lodge #20, Ancient and Accepted Scottish Rite of Free Masonry. Brother Millard was laid to rest with military honors, and respect can be paid to him at Arlington Park Cemetery, Jacksonville, FL. On this date, an American hero entered the U.S. Army. 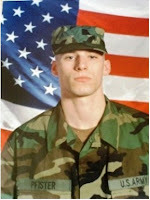 Operation ENDURING FREEDOM Veteran and TN Eta Brother Captain Joshua Sean Lawrence, U.S. Army, who was killed in action in Kandahar, Afghanistan last year, raised his hand swearing to defend our country. Operation IRAQI FREEDOM Veteran and NY Eta Brother Corporal Jacob M. “Puck” Pfister, U.S. Army made the ultimate sacrifice on this date in Baghdad, Iraq when a vehicle-borne improvised explosive device detonated near his dismounted patrol. He was assigned to the 3rd Battalion, 7th Infantry Regiment, 3rd Infantry Division, Fort Stewart, Georgia. Brother Pfister was awarded the Bronze Star and Purple Heart and was posthumously promoted to corporal. He was 27 years old, and his wife was pregnant with their first child, Maddison. Jacob grew up in Buffalo, NY and attended Grover Cleveland High School, where he played tight end on the football team and received a citizenship award at graduation. After attending Buffalo State College, he joined the Army and moved to Florida. Jacob’s mom described her son as a serious man who loved his family. “The way he put it to me is, ‘Mom, who would you rather have over there defending you, me or some other joker?”’ That was classic Puck. Donations may be made to the Maddison Pfister Fund, c/o J.P. Morgan Chase, 2300 Main Place Tower, Buffalo, NY 14202. Respect can be paid to Brother Pfister at a memorial cenotaph located at Fort Stewart, GA, or at his gravesite at Saint Vincent de Paul Cemetery, Derby, New York. World War II Veteran and DE Alpha Brother Pharmacist Mate Second Class Donald Lee Huston, U.S. Navy died on this date in Cape Coral, Florida. Don retired as a Civilian Personnel Management Specialist from the Department of Army. Respect can be paid to Brother Huston at Section WIV, Row A, Site 19 of Delaware Veterans Memorial Cemetery, Bear, Delaware. World War II Veteran and NC Delta Renaissance Brother Lieutenant Reginald Frederick “Mutt” McCoy, U.S. Army Air Corps died on this date in Laurinburg, North Carolina. During WWII he was stationed in North Africa, Italy and Corsica, and was awaiting transfer to the Pacific Theater when the war ended. “The Legend of Laurinburg” was born there on 09 JAN 1916, attended local schools, and studied at the University of North Carolina Chapel Hill. Before completing his college degree, he returned to Laurinburg to help support his mother and siblings and began a 60 year career in the Merchantile and Agribusiness sector that was interrupted by his service to the Nation. Mutt became President of John F. McNair, Inc. and later President and Chairman of McNair Investment Company. He was awarded the Silver Beaver Award by Boy Scouts of America in 1957 and supported their work throughout his life. His son's chapter made him an honorary member. U.S. Navy World War II Veteran NC Delta Chapter President Charles Taylor Foley died a year ago today in Stuart, Florida. He was 84 years old. Born and raised in Charlotte, NC, he wintered over in Stuart, while spending the summers in Oxford, OH where he had resided since 1970. Charles attended the University of North Carolina-Chapel Hill earning a degree in business administration after his service to the nation. He was extremely active at UNC, in addition to SigEp, he served as president of the YMCA on campus, sang in the Men's Glee Club, was Chairman of the Ways and Means Committee in the student legislature, President of the Veteran's Association and Vice-president of the University Club. A businessman his entire working life, he worked for several companies including H.K. Porter, Proctor and Gamble and Square D before becoming a successful small business owner. He sold his final business, Foley's Energy Shop, located outside Cincinnati, OH, in 1997. Respect can be paid to Brother Foley at the mausoleum at Sharon Memorial Park, Charlotte, North Carolina. * We lost World War II Veteran and AL Alpha President Lieutenant Donald Jennings, U.S. Navy Reserve when he passed in Hinesville, Georgia. * On 16 APR, U.S. Army World War II Veterans OK Beta Brother Kenneth “Buddy” Bell, and MO Alpha Brother Paul R. Manocchio passed away. Our thoughts and prayers go out to the brothers, family and friends of brothers Jennings, Bell and Manocchio. * The SPP official Facebook group – SigEps Who Serve – is very happy to welcome ROTC Cadet and SC Epsilon Brother Patrick Hamlin who will graduate this semester and earn his commission in the U.S. Army! * The SPP database now has the names of more than 1810 SigEp Patriots who serve/served in the U.S. military. We are always looking for brothers-in-arms, and we hope you will reach out to join your brothers. Join us on Facebook at http://www.facebook.com/groups/sigepswhoserve. Not on Facebook? Write to sigepswhoserve@gmail.com to join the listserve. For both, you will be asked to provide your military affiliation and home chapter.